The 2' Canare 4S11 Starquad 4-pole Speakon Cable feature a Canare 4S11 Starquad cable with 2 Neutrik 4-pole Speakon terminations. 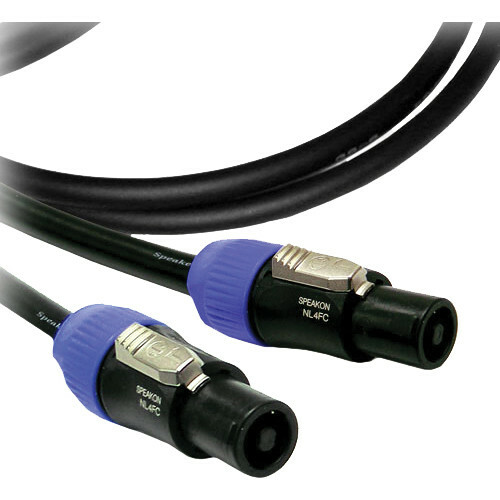 It has a four-conductor construction with 11AWG stranded copper connectors that is designed to eliminate EMI interference with a minimum of resistance. The 4S11 cable has a PE insulation that reduces your signal's induction rate, boosting the cable's frequency response. The PVC jacket is resistant to bending and twisting. It is designed to be used to connect a power amplifier and PA system speaker, or in remote live and portable sound applications. Box Dimensions (LxWxH) 6.4 x 5.1 x 0.7"